Mindfulness is an essential characteristic of good clinical practice. Regular mindfulness practice supports healthcare practitioners’ ability to cultivate a strong and steady presence. With presence comes the ability to listen attentively to patients’ experience of suffering, engage in moment-to-moment self-monitoring, recognize our own errors, refine technical skills, and clarify our values. This enables practitioners to act with compassion, competence, presence, and insight. Mindfulness has proven effective for healthcare professionals in reducing stress, building resilience, increasing curiosity, and fostering wellness and necessary self-care skills. It supports effective therapeutic relationships with patients and cultivates a cooperative nature that is central to creating and sustaining effective and healing teams. The practice of Deep Listening from the head the heart and the body. A talk on Wise Speech in a relationship. Guidance on preparing the body for meditation. There is a moment when we realize that we are about to become a companion of someone who is facing death. Death is not waiting for us at the end of a long road. Death is always with us, in the marrow of every passing moment. She is the secret teacher hiding in plain sight, helping us to discover what matters most. Life and death are a package deal. They cannot be pulled apart and we cannot truly live unless we are aware of death. 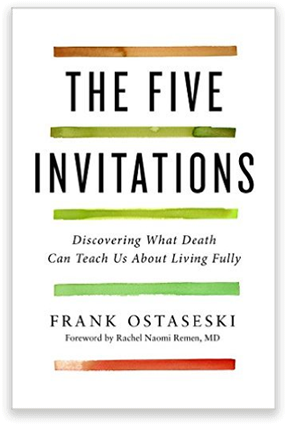 The Five Invitations is an exhilarating meditation on the meaning of life and how maintaining an ever-present consciousness of death can bring us closer to our truest selves.